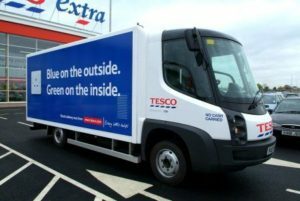 Sixteen of the UK’s biggest van fleet operators have signed up to a government-led initiative to increase the use of electric delivery vehicles. Ahead of the UK hosting the world’s first zero emissions vehicles summit this week, the companies announced their intentions to invest an initial £40 million over the next two years as part of the Clean Van Commitment to increase the use of electric vans. The 16 businesses that are already signed up include Engie, Tesco, Anglian Water, Leeds City Council, Network Rail and Yorkshire Ambulance Service. The Commitment includes two targets: the first, switching a proportion of the companies’ fleets to electric (2,400 vehicles) by 2020 and secondly, committing to deliver zero tailpipe emissions by 2028, with more than 18,000 new vans, if sufficient charging infrastructure and reasonably priced vehicles are available. The aim is to help bring down the price of new electric vans whilst stimulating the second-hand electric van market in four to six years. The Clean Van Commitment targets the largest van fleet operators in the UK. To help more van fleets make the switch, the fleet operators recommend more charging points, tax changes that support electric vans, a greater choice of models and permissions to add charging infrastructure to depots.